FREE SHIPPING & CASH ON DELIVERY IN THE PHILIPPINES!! TIGER WRENCH uniquely designed tool that combines 48 tools into one and makes any repair quick & easy! By simply clicking between the different sizes you instantly have the tool you need for the job! FAST, AND YOU NEED FAST! With Tiger Wrench you'll always have the right tool for the job. THICK, HEAVY DUTY, professional tool that's designed to tackle all your projects around the house, in the shop, or on the job! The uniquely designed 48-in-1 socket wrench that instantly becomes the right tool for any job by simply clicking between the different sizes! 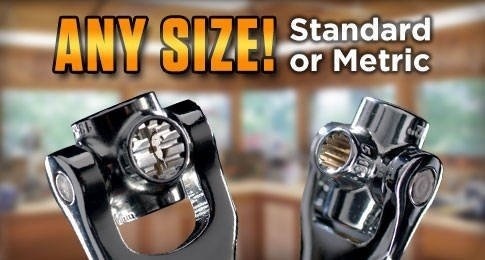 You don’t need multiple socket wrenches or large tool kits, just swivel the head to find the right fit! The Tiger Wrench™ changes from one size to the next as fast as you can click the tool! The unique revolutionary tooth design allows you to do both standard and metric sizes- simply flip the tool around and you have more sizes! Unlike other wrenches, Tiger Wrench™ lets you work at a 45° angles! The Tiger Wrench™ is handy, convenient & saves you time! Tackle projects around the house, on the road, on the job, anywhere! This professional-grade tool is designed with 360° rotating head that quickly changes to the size you need. No more struggling to find the right-size socket head! No more lugging around heavy tool boxes. With this one wrench, take the guesswork out of your projects and make them faster & easier!